The recession Australia deserves to have. Australia’s housing bubble is on the verge of going pop. The housing bubble is based on a few factors, namely an immigration Ponzi scheme, the market distortion created by the Reserve Bank manipulating interest rates, and the demise of Australia’s manufacturing economy which has resulted in a scramble for wealth generation via asset inflation. Australia has staved off an official recession for almost 30 years by sleight of hand manipulation of the economy and official measuring indicators such as GDP. But with so many jobs now based on the housing and construction sector, a bursting of the bubble would see such an impact on the economy that it is hard to determine how this would not result in a recession. This chart that was published last week in The Australian is illustrative of just how big the problem is and for how long the market reckoning has been put off. What is amazing about this chart is that economists such as Alan Kohler truly have no idea why the problem has become so exacerbated. It seems counter intuitive, to say the least, that one of the planet’s largest and most sparsely populated land masses should have a shortage of land and houses, but that’s what has happened. 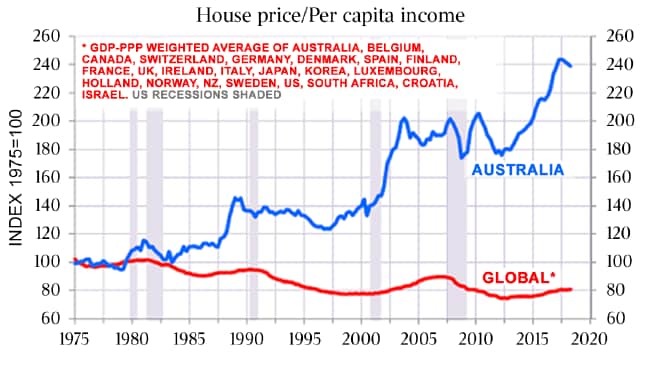 The rise in the Australian house price index directly correlates with the introduction of a policy of multiculturalism through mass immigration. This has always been passed off economically as a net gain for Australia. After all, more people means more GDP! What is never revealed is that welfare spending is counted as GDP. In other words, the government has been calculating it as a net benefit to take money from the populace in the form of tax, give it to foreigners who have migrated to the country, and count their spending as an increase to the GDP. This is why we haven’t had an “official” recession for almost 30 years. As I said, economic sleight of hand. The real economic effect of such a high level of migration has been to push down wages for the lower and middle class while creating an enormous burden on existing infrastructure such as roads, public transport, hospitals, and schools. And then there’s the housing market. The government can’t halt immigration because the entire economy relies on 250,000 permanent arrivals every year so as to be able to keep the official GDP figures looking rosy. The housing market going boom will be bad enough, but the real long term effect of this 30 year policy is the cultural and social destruction of our nation and of our heritage. We’ve given away our country to foreigners so politicians can continue to claim that Australia has not had a recession for almost 30 years. Never has so much been given away to protect so few jobs. So much for serving the electorate that voted for them. 27 years ago Australia suffered the recession that it “had to have”. But looming around the corner is the mother of all recessions, and this one we deserve to have. Podcast #96 – The 28 traits of the modern man episode. Something like 10-11% of the national workforce are involved in housing or commercial building construction. This is going to get really ugly when the music stops. Observed from where I sit which, is to a large degree within that industry. Im a business owner and I know a lot of other business owners. I know a plumber with a single employee and that plumber is carrying $1M in various debt. Home, overdraft, investment, horses etc. I know fit-out builder with half a dozen employees and this guy carries $3M … same home, holiday home, overdraft, investment and horses. Sure there are still green-fields holes in the ground which are turning into Tradie-Cages but the intensity just isnt there like it was for the last few years. Another indicator is the tightening margins and the time it takes to get paid. Seen a few top-heavy contractors go to the wall last year …lets see what xmas brings this year. I see a lot of young tradies out there with new utes or dual-cabs and lot of new summer jet-skis being towed. Sounds like horse sausage is going to become really popular. This Californian send his sympathies. We had the Second Great Depression for the exact same reason… lasted five years. Arguably, things are still not back to normal. I watched the Federal gov’t bail out the Banksters and despaired of ever being wealthy myself. The Powers That Be simply will not allow it. soon-to-be-ex-californian: ronald reagan sold us out in 1986 with the amnesty for illegals. that flipped california permanently blue and it’s just gotten worse since. there is no going back. the ship won’t be righted. it’s going down. The time for moving levers back and forth and twiddling with economic dials is over. We need now to prepare for new, dangerous, but exhilerating challenges of a failing society, if you know what I mean.